This article is written by Muni & Nidhi from Delhi. They are both Indian souls traveling India, China, North America and exploring food and photography out of hectic office life. It was a surprise to see too many turbans and fellow Indians in a single International flight . The flight was Air India (Delhi to Toronto) and beginning of our North America chapter. Toronto is the largest city in Canada and the provincial capital of Ontario. We already had bucket list in mind for our travel and which is still growing up. Now let’s get into some technical…. 01:45 AM IST: Boarded to our flight to Toronto from New Delhi’s IGI Airport Terminal 3 by Air India. This is an International Flight but din’t felt to be one exactly. The leg space was not so good and spacious so we felt bit fixed and uncomfortable. Though you can enjoy the multiple language audio/ video entertainment including the facility for on air shopping. The attendants were very polite and in Indian traditional attire. We reached the Pearson Airport at 7:45 AM EST. Flight duration 15 hr approx. We reached Canada in the morning and were waiting to get to the roads. But all this jet lag and only option we left with is sleeping. Ok, so enough of technical and details. Now lets have our reviews and feast for eyes. 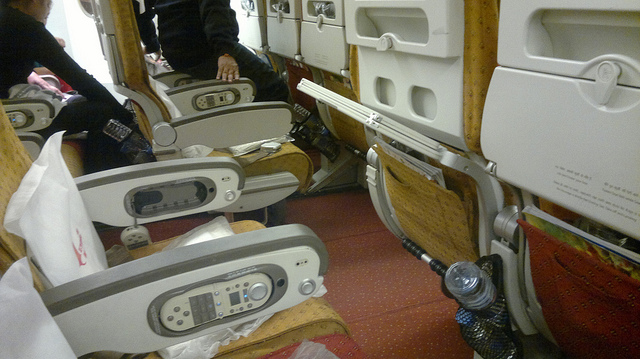 A look at the seating area and leg space for the economy class of Air India Toronto flight.